Successfully Added Mini NVR System - 8 Channel, HD Networking Video, Cloud P2P, ONVIF Support, HDMI Support, LINUX OS to your Shopping Cart. It has 8 channel full HD recording at the resolution of your choice, 720p, 960p, and 1080p. This system comes with an HDMI video output interface that makes it compatible with HD monitors. The Mini NRV has ONVIF support, it can work well with IP cameras certified by ONVIF. Cloud P2P enables you to view the video feed through almost any device. This Mini NRV is designed for the security and safety of your home. It is an ultra-recording system that has 8 channel support. This means the system is capable of recording feed for 8 different IP cameras in full HD. The resolution of the camera can be 720p, 960p, and 1080p, you can choose the resolution of the camera according to your preference. It is a compact system that takes up less space and is available with extensive features. The system has an HDMI port that lets you connect it to an HD display. It also has a VGA output interface that makes it compatible with traditional VGA monitors. Other ports that system has includes TF card slot, DC IN, RJ45, eSATA + USB and 2 USB port 2.0. The USB ports allow you to connect a USB mouse and easily backup the files. 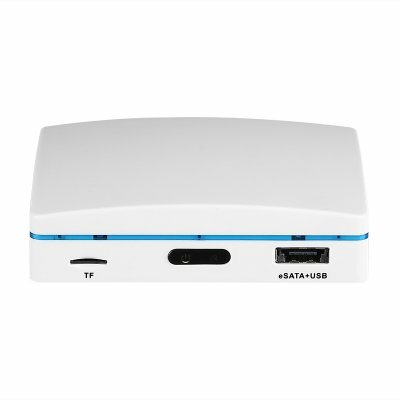 The eSATA port allows you to connect it to eSATA HDD and SDD for easy storage space. Moreover, the system has a dual stream technology with different recording modes. This includes manual, scheduled, an alarm event, full-time, and motion detection modes. The video feed recorded by the system can be viewed from any device that is connected to the internet. With the help of Cloud P2P feature, you can view the feed from your computer, smartphone, and tablet. It is an easy and simple way to a peace of mind that your property is secure. The NRV has surveillance standard ONVIF support, it means that the system is compatible with the huge number of ONVIF certified IP cameras and software from the third party. The operating system of the recorder is LINUX that enables you to view the feedon your mobile devices powered Android or iOS system. The Mini NRV system comes with everything you need for surveillance. The package includes a mini NVR, a CD, and an NVR power adapter. When it comes to the security of the house, you should compromise it. The best way to secure your property is by getting the Mini NRV system. The Mini NVR is available with a 12 months warranty. The system is supplied to you by the leader in electronic devices as well as wholesale security gadgets.